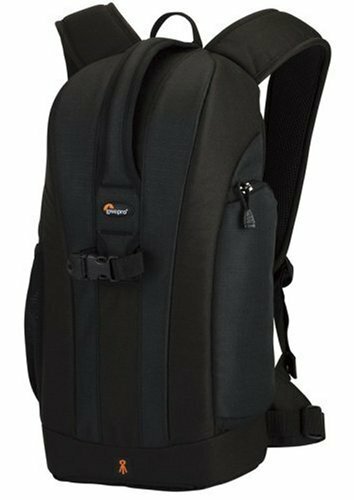 The Flipside series of camera backpacks provides a secure and comfortable carrying option for a digital SLR camera with a lens attached along with additional lenses and accessories. This compact backpack features a lightweight design providing back-panel access to camera gear, ensuring equipment will be safe and protected. Designed to provide peace of mind for photo enthusiasts are on the go, out on assignment, vacationing or just shooting with friends and family, This backpack also has a back entry that provides easy access to all areas of the main compartment as well as extra security when worn. This Flipside backpack has a removable accessory pouch enables users to carry cables, chargers, manuals and other peripherals when they need them, and leave accessories behind when they don't. The durable, water-resistant outer fabric protects equipment against moisture and scratches and a detachable waist belt plus an adjustable sternum strap provide a customizable fit for lightweight comfort. Additional features include SlipLock accessory loops that expand carrying capabilities via SlipLock compatible pouches and a mesh side pocket to keep a water bottle, cell phone or other items accessible. The detachable waist belt and adjustable sternum strap stabilize the pack and distribute weight evenly ensuring a comfortable and secure fit for photo enthusiasts keeping up with the most rigorous of schedules. The main compartment of the Flipside 200 accommodates one digital SLR with 80-200 mm f/2.8 lens attached, plus 1-3 additional lenses or flash units. Lowepro has taken an industry by storm with their bags. This bag is the 3rd Lowepro bag I've owned over the last 4 years (All upgrades). I'll just get my details out of the way. In this bag I carry a Canon XTi body with the Battery grip, an attached Canon 28-135mm IS USM, the "nifty 50" 50mm f/1.8 II Speedlight 580EX II Flash and there is room in there for 1 more lens (I've got a Tamron 75-300mm in the mail) and an small omnibounce, cleaning solution and a CF card reader.. I ordered this to have something small and easy to carry on my trips out of state that I could carry on to the plane with me and still have a good compliment of equipment without lugging everything along.. Very well built bag, like I had mentioned earlier, this is my 3rd Lowepro bag.. I've never been let down by the quality and this bag does not disappoint. Security is top of the line as well on this bag with the opening back panel. The bag holds a variety of equipment while maintaining the "this ain't a camera bag" look.. There were a few things that I didn't like about this bag... they are listed below. The sliplock system mounting straps are very poorly located on the shoulder straps. If one were to use these sliplocks, with lens cases like the 1N and 1W, they would find that the cases sit right on the tops of your shoulders if ya carry the bag cinched down, or over the shoulder if ya wear the bag lower on your back with the shoulder straps extended. These would have been put to better use on the side of the bag where they won't impede view or full range of motion for your head. The side pocket is very small and very tight.. I fit in a lens pen, a 4 pack of batteries and 2 cf cards and I have a difficult time zipping the pocket closed. Forget about sticking anything else in there. I wish the main compartment zipper was able to be zipped lower than it is.. As the bag sits right now, the zipper leaves a 2-3 inch well at the bottom of the bag that could be used for a little more room. Being that I am carrying a XTi with the attached battery grip, the ergonomics with the camera makes it an uncomfortable carry for long periods. I'm not a fan of feeling the onboard flash on the camera pushing into my back. Pockets could have been a little bigger or the bag could have been designed with a filter wallet sleeve built into the bag. I currently have to carry all my filters on my lenses because the bag will not accomodate the Lowepro filter wallet that I already own. I hope my review has been helpful in choosing your next camera bag. This is a good camera backpack. I have a Nikon D60 with 2 zoom lens. 18-55 is always fitted to the body when it is in the backpack. 55-200 will go in one of the compartment. My SB-600 speedlight is in one and the rest is still empty. I put the back cover of 18-55 and the camera's front cover on one of the compartment. It has a side pocket where in you can keep the memory cards and cleaning kits(if it is not big :) ).This one has a latch for holding the tripod. Onlything I didn't like is, I cannot keep the tripod with the latch if I want to keep the tripod in its own bag and attach to the back pack. There is a holder at the bottom of the back, which you need to pull out, but it is small and cannot hold a tripod with its bag. (may be a small one may fit, but mine is a medium one). The belts are positioned perfectly and is very comfortable. I was looking for something small that I can carry my gear on hikes (Canon 50D + 400mm prime lens + monopod). I do have to remove all the dividers to fit my camera with lens attached, I may be able to squeeze in another lens but I'm not sure if I want to do that since I only want to carry as little as I can on a 2 hours hike. It is actually not that big, sure it can be an inch or so less deep or thick but it does not bother me. The only thing I wish is for internal zippered slots for cards and lens caps or small things like that. I know it has an external pocket that may do, but I want it right there while I have the pack open and taking my camera out. For my purpose, this is almost perfect (it will be perfect if it is a messenger bag at the same size). Small problems but good bag. I have a Canon XSi 18-55mm, 75-300mm, extra battery, charger, cable, 6 sdhc cards, remote shutter release, couple filters and still have room for another small lens (maybe a prime or macro). It was a little smaller than I had envisioned but it works for my needs. Mostly for vacations and photowalks, where I don't want to be weighted down. This is strictly a camera bag, since it is on the small side there is not much room for anything else. -Waist belt could be a better quality since the main attribute of this bag is flipping over to access gear, thus the "Flipside" part. Maybe making the strap wider and using a more padded strap instead of the nylon. -Zipper quality could be better, doesn't zip smoothly. Might be problems down the road, we'll see. Was expecting zippers like on my Kelty hiking bag, which are top quality. -The tripod monopod pocket at the bottom is hard to get in and out but really not a big deal. Also unless you have a very small tripod this is not going to work. A monopod is much more realistic to carry with this feature. -My big problem with this bag is the plastic connecting thing on the waist belt. Only used the bag twice and it broke when tightening. So I called up Lowepro, talked to a guy and he shipped me a replacement right away. Great customer service, nice to know they stand behind there products. My concern is replacing it with the exact same connector. Is it going to break again? He said he has never had this come up before and that maybe I just got a defective part. Very comfortable fit when loaded with my camera and other gear, would recommeneded this bag, very durable and water repelent. I could go for hours wearing this backpack, I cannot express enough how comfortable it is. I can fit a D80 with lens mounted (one of the following), 100mm macro, 17-50/2.8, 12-24/4 (with hood reversed!, though it's tight), and SB600 flash into this bag, without even using the interior accessory pouch/bag-thing. If I have a bigger lens (e.g., a 70-300 or 70-200/2.8), then it needs to be the one mounted on the camera. Also, in that case the flash only fits if I shove it into the accessory pouch. The side accessory pocket does not expand much, so you can only put thin things in there -- e.g., memory cards, pens, white balance card, etc -- even a hotshoe bubble level is pushing it. The other side pocket is kind of small too; I can fit a (very) small umbrella, or maybe a flash in there. It seems to be the perfect size for a 16oz bottle of water. The fabric (of the bag, not the pocket) is fairly thick, so I've never worried about rain soaking through. The tripod pocket is great, though it works best for tiny tripods. I have been able to get a "light" tripod (El Carmagne 530) to stay put in there, if I use a tiny bungie cord to tether the tripod's center colunm to the little loop at the top.